Despite the fact that an increasing number of job applications and other important resources are being offered solely online, not everyone in the U.S. uses the internet. This simple fact has been emphasized countless times in years past, through discussion of the “Digital Divide.” Most recently, in the report Who’s Not Online and Why, Pew Internet indicated that, as of May 2013, 15% of American adults don’t use the internet. Why not? About one-third (34%) of non-users just don’t believe the internet has any relevance to their lives. These non-users are not interested in using the internet, and some think using the internet is a waste of time. 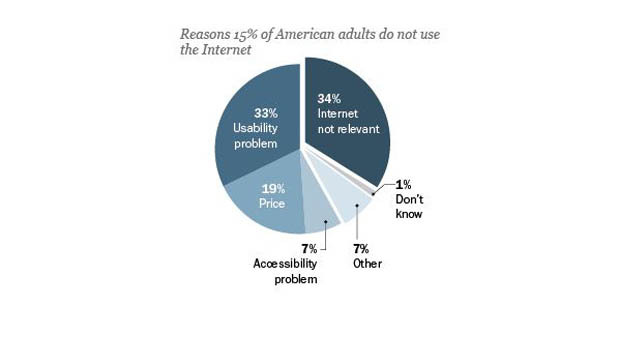 Another one-third of non-users (32%) cite usability issues as reasons for not using the internet. Some of these non-users deem using the internet as too difficult or frustrating, while others claim they are “too old” or physically unable to use the internet. About one-fifth (19%) do not use the internet because of the expense it entails, and 7 percent cite a lack of access to the internet. Libraries: What attempts have you made to reach non-users to market your technology resources and classes? Have they been successful? 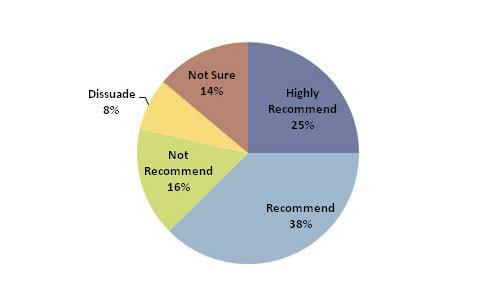 For the past month, library staff have weighed in on our survey about the privatization of public libraries. More than 2,500 people from every state and 15 countries responded, making this our most popular 60-Second Survey yet. The nearly 1,500 comments we received with additional thoughts on privatizing the management of public libraries made it even more clear that this is a topic of great interest to library professionals and other stakeholders. 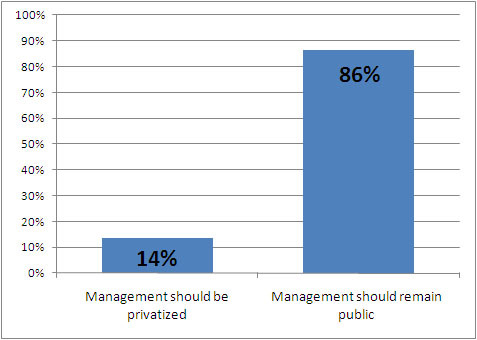 Given an either-or choice, survey respondents overwhelmingly sided with public sector management, with 86% agreeing with a statement that management should remain in the public sector so that profit does not become libraries’ primary objective. The other 14% agreed that management should be privatized if it means that libraries can do a better job of providing services and materials to patrons at lower costs. Should management of public libraries be privatized if it means lowering costs, or remain in the public sector so that profit doesn’t become libraries’ primary objective? Survey respondents identified whether they thought public or private sector management was more likely – or equally likely – to achieve a list of outcomes for public libraries. Public sector management scored the highest, by far, on all factors but two: reducing operating costs and making library operations more efficient. 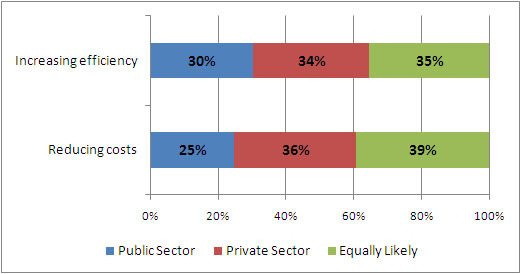 In these areas, respondents were closely split among the three answer choices, with around 1 in 3 voting for each (the public sector, the private sector, or both as equally likely to achieve these outcomes). What type of management is more likely to achieve the following outcomes in public libraries? 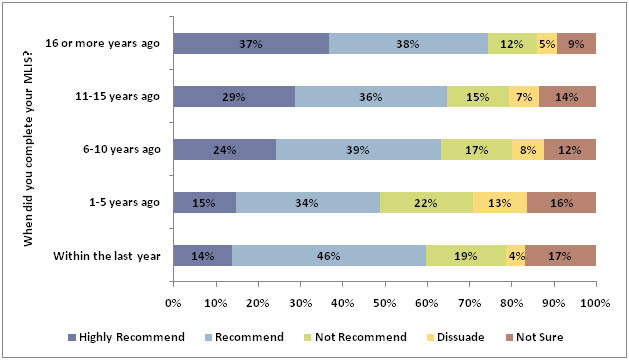 At least 3 in 4 respondents identified public sector management as the best way to improve the quality of library services, increase the relevance of libraries’ collections, employ qualified staff to meet community needs, and protect patron privacy. 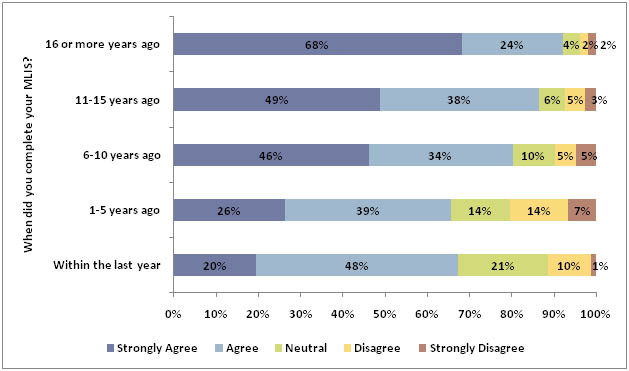 Public sector management drew even more support – from nearly 9 out of 10 respondents (88%) – when they considered the library’s ability to serve all the members of its community and the strength of the library’s connection to the community it serves. 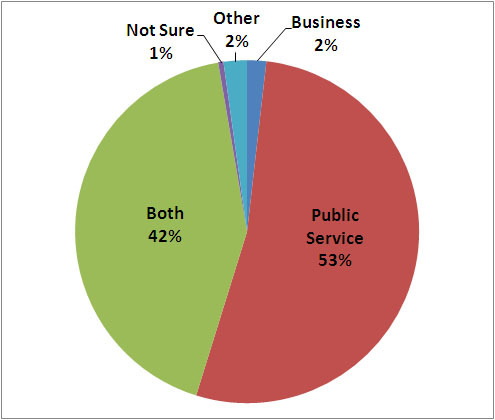 More than half (53%) the respondents reported that a public library should be run like a public service rather than a business, but almost as many (42%) said it should be run like both. Just 2 percent thought that a public library should be run like a business. Should a public library be run like a public service or a business? Eight in 10 (82%) respondents thought that privatization would have a negative impact on library staff’s job security and benefits or retirement plans. While the majority (66%) thought the negative impact would also extend to job prospects for degreed librarians, a higher percentage were unsure of the potential impact (17%) or thought privatization would have no impact on job prospects (9%). Stay tuned for a more in-depth report of survey results in an upcoming Fast Facts. Until then, we’d love to hear your thoughts so far – please leave comments below! American Libraries will be publishing Jamie Helgren’s (DU-LRS Research Fellow) article on the Future of the Book in their January/February issue. See the article, “Booking to the Future” online now at: http://americanlibrariesmagazine.org/features/11302010/booking-future. This article is based on the LRS 60-Second Survey: The Future of the Book conducted earlier this year. Several LRS staff members contributed to the analysis of the data and you can see more about the survey results on the LRS blog and in two Fast Facts issues. So far, we’ve had a great response to our 60-Second Survey on privatization! However, our geographic representation is a bit skewed. Nearly three-fourths of our respondents come from just 9 states–those that are colored in the map above. In contrast, the remaining states–those in white–are each represented by less than 2% of the survey respondents. Do you live in a white state or another country? If so, we need your help! Please take a minute to complete the survey so that the results will more accurately represent the opinions of library staff across the United States as well as internationally (as of now, 2.5% of our respondents are international). Edited to add: Thank you for your interest! The survey is now closed. Preliminary results will be posted to the blog in December. Recently, the New York Times published an article about the privatization of public libraries. This article described the trend in some communities to turn over the management of public libraries to private organizations. In response to this article, library staff engaged in spirited online discussions about whether libraries should be privatized. Taking notice of these discussions, Library Research Service at the Colorado State Library has launched a new 60-Second Survey to get your opinions about privatization. Do you think privatization is a good option for libraries? How would it impact library collections, services, staff, and patrons? You tell us. Last winter, LRS posted a 60-Second Survey on “The Future of the Book.” More than 1,300 people responded, with nearly 950 leaving additional comments about their thoughts on the topic. With all that information, we were able to write two Fast Facts providing analysis of both the results and the comments. The comments proved to be one of the most interesting aspects of the survey, revealing passionate and philosophical thoughts on the future of paper and electronic books. Six common themes emerged as influences on future format choices: the existence of multiple formats, technological advantages, emotional/aesthetic appeal of paper books, content, cost, and change over time/generation. The first Fast Facts addresses results and comments related to cost and technological advantages of paper versus electronic formats, while the second report discusses the remaining comment categories and how they related to the type of library in which survey respondents worked and whether they owned an e-reader.